Rehab At Home: Why Should I Talk To My Child About “First” And “Next”? Today’s Rehab At Home post is about “temporal concepts”, or in short, “how to talk about a sequence of events”. Temporal concepts involve words such as “first” and “next”, to describe the order that events occur. If your child masters the skills to talk about temporal concepts, this will also help their early mathematical, pre-literacy and problem solving skills. Why Should I Talk To My Child About “First” And “Next”? Temporal concepts are difficult to master as ‘time’ is abstract – not something that you can point to or hold. For children to learn these concepts, they must have many opportunities to listen to them being used in context, through play and daily routines. There are lots of other words that can be used to describe temporal concepts: then, second, third, last, before, after, while, at the same time. describing sequences of events. This is a skill children need in order to talk about their experiences, tell stories in the correct sequence, and later read and write their own stories. How Should I Work On “First” And “Next” With My Child? 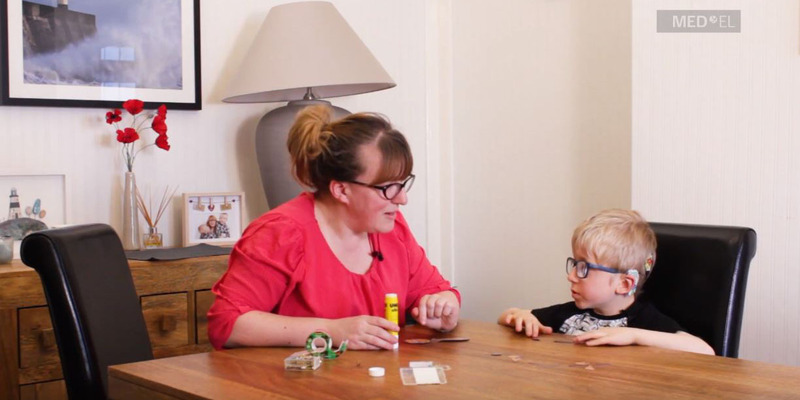 In the video, Matthew’s mum introduces the concept of “first” and “next” during a craft activity. Matthew’s mum describes what they were going to do. She uses sentences such as “First we need to do his hands, and then we’ll do the tail”. Matthew’s mum puts emphasis on the sequencing words first, and next using acoustic highlighting. She also repeats these words in her instructions to help Matthew understand these concepts. You can download the “Make A Monkey” activity by clicking here. There are lots of ways you can incorporate sequencing concepts into your daily routine. While playing with your child and their toys, cars, blocks or dolls, try to use sequencing words such as first, then, next, last. For example, “The little car is going to go through the tunnel first”; “The doll is hungry. She is going to eat dinner and then she can go to bed”. Add sequencing words to the instructions you give your child throughout the day. Use ‘acoustic highlighting’, or emphasize the words to make them stand out. For example, “First we need to put your socks on, then we can put your shoes on”. Using sequencing words during your play and daily routines helps your child to learn these concepts. Depending on your child’s age, it is ok if they don’t understand or use these words yet. Children need to hear words many times in context, before they begin to understand and use the words themselves. Encourage your child to help with (easy and safe!) tasks in the kitchen. Read the recipe together or explain the process of cooking the meal before you begin. You should highlight the sequencing words while you cook. For example: “Before we begin, we have to turn the oven on to 200 degrees”; “After we cut up all of the vegetables, we can put them into the frying pan”. Use a weekly schedule or calendar to talk about what is happening each day in your house. Model the correct sentences for your child so that they have a chance to hear sequencing words being used in sentences correctly. For example, “Today I am going to go shopping before I pick you up from school. After school, we can go to the park”. At dinner time, take turns talking about what happened that day. For example, “Today I went to work, then I went shopping. After I finished the shopping, I went to the cinema”. Want more from Rehab At Home? Check out all the videos on our Rehab At Home intro page.